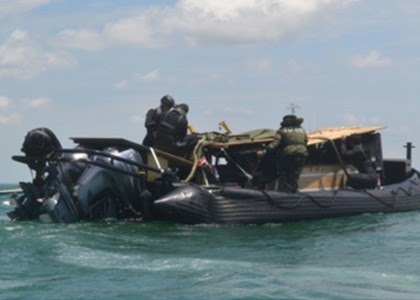 SELANGOR – Rejimen TUDM telah melaksanakan latihan pengguguran sebenar Air Droppable Rigid Hull Inflatable Boat (ADRHIB) di Perairan Sungai Besar, Kuala Selangor. 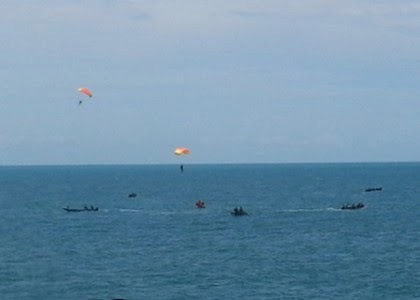 Latihan ini adalah bertujuan untuk meningkatkan kemahiran anggota PASKAU khasnya anggota Maritime Para Rescue (MPR) dalam melaksanakan misi menyelamat di perairan sekiranya berlaku sesuatu kejadian yang tidak di ingini. Selain itu ia juga untuk mengekalkan kompetensi dan tahap kesiapsiagaan juruterbang dan anak-anak kapal No 20 Skn dalam melaksanakan operasi pengguguran dari udara. Latihan ini telah mendapat bantuan dan sokongan sepenuhnya dari Platun Hantaran Udara 10 Bgd Para yang terlibat secara langsung dalam proses rigging dan penyediaan payung kargo serta peralatan untuk pengguguran. Pihak Jabatan Laut Malaysia juga telah memberikan bantuan dan kerjasama sepenuhnya dalam aspek mengangkat Boat Aerial Delivery Separation System (BADSS) atau pelantar yang digunakan dalam pengguguran ini. 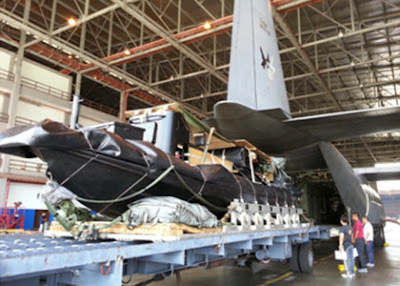 The DND through the Revised AFP Modernization Program intends to apply the sum of 2,5 bio PhP being the Approved Budget for the Contract (ABC) to payments under the corresponding contract for eight brand new Ampibious Assault Vehicle acquisition project with Integrated Logistics Support (ILS) for the Philippine Navy. Delivery of 8 brand new AAV is required within 850 days with ILS upon opening of Letter of Credit. Bidding is open to all interested bidders, whwther local or foreign, subject to the conditios for eligibility provided in the Implementing Rules and Regulatios (IRR) of Republic Act 9184, otherwise known as the "Government Procurement Reform Act". Bids must be delivered before on or October 24, 2013 and will be opened in the same day. 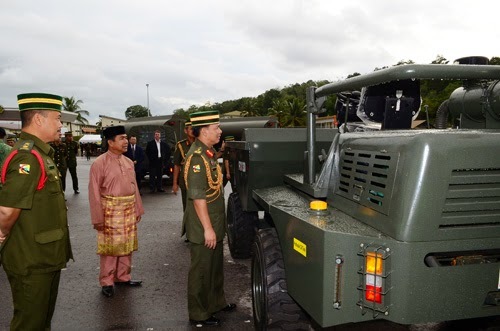 BERAKAS – The Royal Brunei Armed Forces (RBAF) held a ceremony for the official handover of forty vehicles from a number of local vehicle suppliers at the Parade Ground of the First Battalion Royal Brunei Land Forces (RBLF) in Berakas Garrison this morning. The Royal Brunei Armed Forces received one Truck Tipper, two Light Dumper Truck, two Truck Water Bowser, a Truck Aircraft Refueller Bowser, a Forklift 10T, sixteen pieces of Land Rover ¾ Ton GS, two Battle Field Ambulance, three Ford Transit for nine passengers and six Ford Transit for the fifteen passengers and six Inflatable Boat complete with trailers. 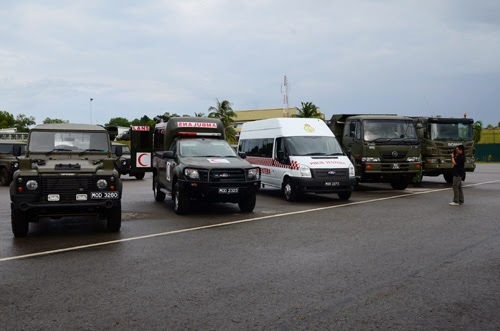 Replica keys for the vehicles were handed over to the Commander of the Royal Brunei Armed Forces, Major General Dato Paduka Seri Haji Aminuddin Ihsan bin Pehin Orang Kaya Saiful Mulok Dato Seri Paduka Haji Abidin by the representatives of the suppliers of these vehicles. Representing the local suppliers in the ceremony was Major (Rtd) Haji Mohd Jair bin Haji Abdul Wahab, Director of Azra Trading Co. Ltd, Mr Teng Chee How, Sales Manager of Premier Automobiles Sdn. Ltd. and Mr Roger Fletcher, General Manager of QAF Group. Also present were Brigedier Jeneral Dato Seri Pahlawan Haji Yussof bin Haji Abd Rahman Commander of Royal Brunei Land Force, Deputy Services Commanders, Directors and Senior Officers from the Ministry of Defence and the Royal Brunei Armed Forces. In accordance with the process of modernization and development of today's military capabilities, military equipment are not exempt from the process of modernization in which these vehicles will increase the responsiveness of the Royal Brunei Armed Forces in dealing with all the missions given rapidly and effectively. KUALA LUMPUR, (Bernama) -- Malaysia can now consider the Advanced Super Hornet for its multi-role combat aircraft needs, which offers significant retrofittable enhancements, including a 50 per cent increase in the capability to avoid radar detection, an enhanced engine and additional 260 nautical miles range. Mike Gibbons, Boeing's Vice-President for F/A-18 & EA-18 Programmes, said the fighter aircraft's additional combat range has been made possible because of the conformal fuel tanks, which gives it a great advantage in being able to fly faster than with external tanks, making it more formidable against enemy aircraft and other threats. This, along with other advanced features such as an upgraded electronic warfare system, integrated counter-measure system and enclosed weapons pod, has caught the eye of many of the Super Hornet's current and potential customers including the US Navy and Royal Australian Air Force. Gibbons said the increase in price for the Advanced Super Hornet package would currently be nil because Malaysia can buy the Block II Super Hornet and then decide what it wants to do later in terms of retrofitting. These advancements, which could be affordably retrofitted on an existing Block II Super Hornet aircraft or included on a new jet, were relayed to the Royal Malaysian Air Force (RMAF) and Defence Ministry officials during Gibbons recent visit to Malaysia. 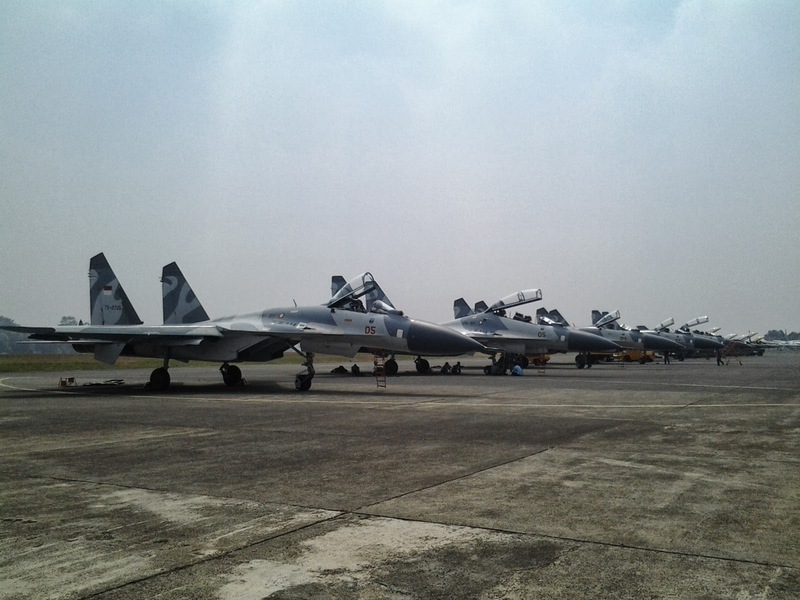 RMAF reportedly has a requirement for 18 fighters to replace its MiG-29s as well as for three airborne early warning aircraft. Depending on what the customer wants, Gibbons said the additional cost of the full suite of the enhancements and what he describes as technology evolutionary changes to the renowned Super Hornet fighter aircraft would be about 10 per cent. "We, the Hornet Industry Team, comprising Boeing and our partners Northrop Grumman, Raytheon and GE Aviation, always like to push the edge of what we can do to the jet beyond the customers' requirements," he told a media briefing. Designed with a lot of growth, he said: "Customers see what we can do (when) we mature the technologies and they want those (advancements)." Boeing and the Hornet Industry Team are investing in next-generation capabilities, so warfighters have what they need and when they need it, which enables the customer to acquire it in a cost-effective manner. The improvements will ensure that the Advanced Super Hornet outpaces enemy aircraft and defences through 2030 and beyond, especially when that enemy tries to deny access to a specific area, such as skies over international waters near its assets. The enhanced features of the Advanced Super Hornet could be made available to customers as early as in 2018, Gibbons said, adding that its advanced crew station was in immediate demand in the international fighter market. Additional advanced features customers can get the Advanced Super Hornet include enhanced survivability, internal infra-red search and track (IRST), radar upgrades, an enhanced engine that includes a 20 per cent greater thrust, and a next-generation cockpit. Advanced Super Hornet prototype flights commenced on Aug 5, 2013 from Boeing's manufacturing plant in St Louis, the United States. 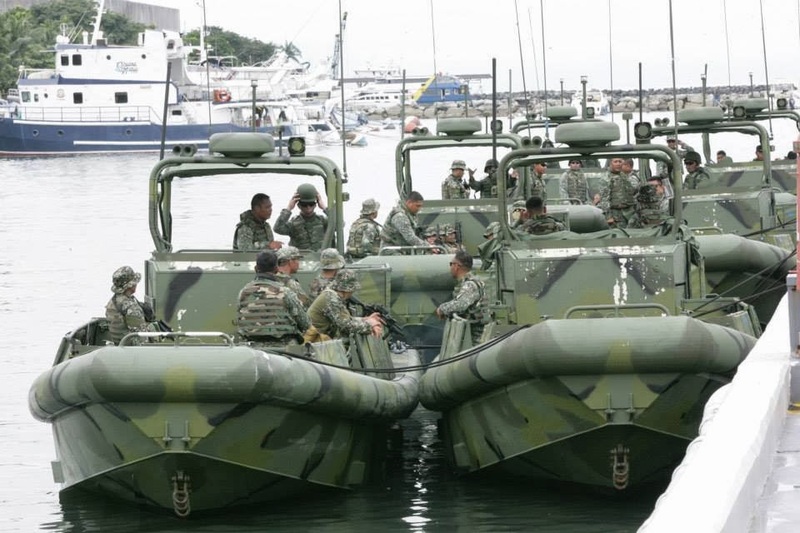 MANILA - The United States gave the Philippine military six patrol boats Wednesday to be used in a southern region where armed militants are active, the military said. 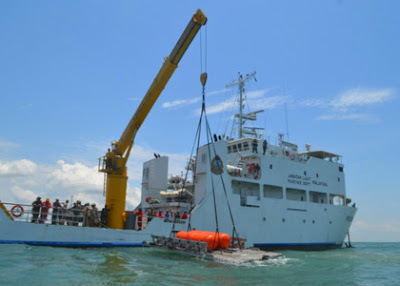 The small-unit riverine craft (SURCs) are part of a US program to train and equip foreign military forces for "counter-terrorism", Philippine Navy chief Vice Admiral Jose Alano said in a statement. "The SURCs will be deployed to augment our sea-based forces to address terrorism and lawlessness such as the current crisis in Mindanao," Alano added. For the past three weeks, thousands of elite troops have been battling Muslim guerrillas of the Moro National Liberation Front (MNLF) who occupied several coastal villages in the key southern port of Zamboanga on Mindanao island. Mindanao and nearby island groups are also a hotbed of other armed groups including communist guerrillas, bandits and Abu Sayyaf, an Islamic extremist group blamed for the country's worst terror attacks. Funded by the late Al-Qaeda mastermind Osama bin Laden in the 1990s, Abu Sayyaf has targeted foreigners with kidnappings for ransom. The group killed two Americans in a 2001 hostage crisis that lasted more than a year. US troops have been based in the southern Philippines since 2002 to help train local troops in hunting down members of the Abu Sayyaf, which is on the US government's list of so-called foreign terrorist organisations. 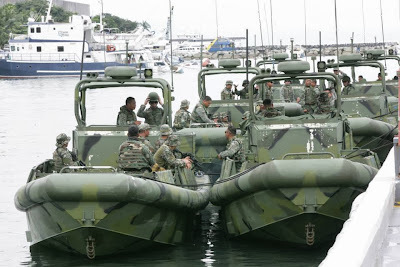 Designed to patrol rivers and coastal areas, the high-speed, small-unit riverine craft can carry 14 fully-armed marines and six crew members, Philippine marine spokesman Captain Rowan Rimas told AFP. The boats are worth a combined $12 million, he added. MAKASSAR, KOMPAS - Skuadron Udara 11 Wing 5 Pangkalan Udara Sultan Hassanudin sebagai operator jet tempur Sukhoi kini siap tempur setelah pesawat-pesawat tempur itu dilengkapi peluru kendali. Rabu (25/9), enam jet tempur buatan Rusia tersebut diserahkan di Makassar, Sulawesi Selatan. "Pesawat tempur kita sudah siap beroperasi mempertahankan kedaulatan Indonesia. Bom untuk pesawat ini sudah dibuat di Indonesia. Rudal, radar, dan persenjataan lain sudah ada serta siap beroperasi," kata Menteri Pertahanan Purnomo Yusgiantoro dalam acara penyerahan itu. Hadir pula Panglima TNI Jenderal Moeldoko, tiga kepala staf angkatan, dan Duta Besar Rusia untuk Indonesia Mikhail Galuzin. Perlengkapan lain yang sudah dimiliki, antara lain, flare, dan chaff untuk mengelabui lawan, Menhan menjanjikan perlengkapan anti-jam dan jammer segera ditambahkan untuk jet tempur Sukhoi Skuadron Udara 11 tersebut. Sejak kedatangan jet tempur Sukhoi pertama kali pada 2003 pada zaman pemerintahan Megawati Soekarnoputri, persenjataan Sukhoi terus dilengkapai. Ketika itu, rudal belum tersedia untuk pesawat tempur buatan Rusia tersebut. "Penerbang skuadron akan ditambah hingga mencapai jumlah ideal 1,5 kali jumlah pesawat dalam waktu dekat," kata Kepala Staf TNI Angkatan Udara Marsekal Ida Bagus Putu Dunia. Saat ini Skuadron 11 memiliki 16 pesawat Sukhoi. Dalam serah terima tersebut, sebanyak 16 jet tempur Sukhoi Su-27, Sukhoi Su-30, hingga varian terbaru Sukhoi Su-30 Mk II dipamerkan di apron Lanud Hasanuddin. Para penerbang dan awak darat dari Skadud 11, Skadud 5, dan Skuadron Teknik 044 bersiaga di dekat pesawat tempur tersebut. Pelatihan untuk penerbang tempur pengawak Sukhoi dilakukan saksama oleh TNI AU di Indonesia, China, dan Rusia. Komandan Skadud 11 Letnan Kolonel (Pnb) Dedi IS Salam mengaku sudah delapan penerbang skuadronnya yang berlatih di Rusia. "Saya pernah berlatih di China dan Rusia. Latihan di Rusia berlangsung intensif selama tiga bulan," kata Dedi yang lulusan Akademi Angkatan Udara (AAU) tahun 1995 itu. Dedi sudah membukukan lebih dari 1.000 jam terbang dengan Sukhoi selama empat tahun bertugas (2008-2013) dengan diselilingi pendidikan Sekolah Staf Komando (Sesko). Seorang penerbang yunior, Letnan Satu (Pnb) Rahman Fauzi, mengaku baru setahun dinas di Skadud 11 dan sudah membukukan lebih dari 100 jam terbang. Peluru kendali (rudal) yang dibawa Sukhoi milik TNI AU bervariasi seperti rudal udara ke udara R-73E yang setara dengan rudal Sidewinder dan rudal RVV-AE. Ada juga rudal udara ke darat untuk serangan permukaan, yakni Kh-29 T/TE dan Kh-31. Rudal tersebut dapat menjangkau sasaran dalam jarak masing-masing 40 kilometer dan 110 kilometer. "Bom aktif dan bom latih sudah bisa kita buat sendiri di dalam negeri. Demikian pula munisi untuk kanon di Sukhoi," kata Purnomo. Ricky Egam, pemilik PT Sari Bahari yang membuat bom latih untuk jet tempur Sukhoi, menerangkan, peminat bom latih buatan Indonesia juga datang dari mancanegara, seperti Vietnam dan Myanmar. "Bom latih buatan Indonesia spesifikanya mirip bom aktif buatan Rusia, terutama pembuatan fin (bilah sirip) ekor bom buatan Indonesia," kata Ricky. Direktur Program Imparsial Al Araf yang aktif dalam koalisi masyarakat sipil untuk transparansi anggaran militer mengingatkan agar pengadaan jet tempur Sukhoi dan perlengkapannya harus dilakukan transparan dan tidak terjadi mark up. Menurut Purnomo, perbedaan harga pembelian Sukhoi pada tahun anggaran disebabkan perbedaan spesifikasi dan ada fluktuasi nilai tukar serta kenaikan harga. New Zealand is negotiating with Norwegian company Kongsberg Defence Systems to purchase Penguin Mk 2 Mod 7 anti-ship missiles from Australia, according to sources. 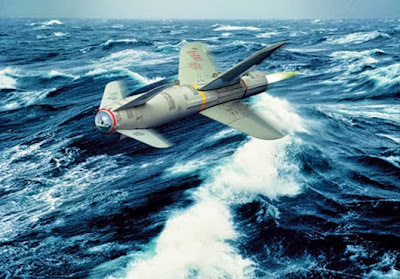 This follows confirmation by an Australian Department of Defence (DoD) spokesperson to IHS Jane's that the Australian-owned missiles are being marketed for sale, with unspecified conditions, by Kongsberg, the weapon's manufacturer. "The DoD is aware that New Zealand is exploring options to procure some of the Australian stock," the spokesperson added. A Kongsberg official told IHS Jane's in London on 12 September that the company hoped to sign a contract for Penguin Mk 2 Mod 7 anti-ship missiles for the Royal New Zealand Navy's (RNZN's) new Kaman SH-2G Super Seasprite maritime helicopters by the end of the year, but did not disclose from where the missiles would be sourced. MANILA, Philippines -- An Indonesian aircraft manufacturer was the only firm to bid for a Department of Defense contract to supply the Philippine Air Force with two medium-lift transport planes worth more than P800 million. According to one source, three companies bought bid documents but only PT Dirgantara Indonesia/Indonesian Aerospace (IAe) and Sikorsky Aircraft submitted offers. When the bids were opened at the DND in Camp Aguinaldo on Wednesday, only PT Dirgantara qualified as a bidder. It offered a price of P812,550,000. Another source said Sikorsky had offered the C27 Skytruck while PT Dirgantara offered the NC212-200 Aviocar. 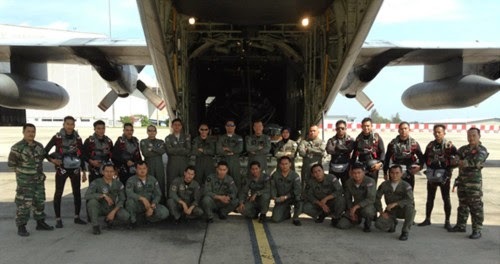 “Assistant Secretary Patrick Velez has given the (Air Force’s) technical working group seven days to evaluate (PT Dirgantara’s) bid,” he said. Dua pesawat T-50i Golden Eagle tiba lagi di Lanud Iswahjudi, kedatangannya di sambut langsung oleh Komandan Wing 3 Lanud Iswahjudi Kolonel Pnb Minggit Tribowo, S.I.P., dan segenap pejabat di hanggar Skadron Udara 15 Wing 3 Tempur Lanud Iswahjudi, Rabu (25/9). Kedua pesawat tersebut dipiloti oleh penerbang dari Korean Aerospace Industries (KAI), setelah menempuh perjalanan panjang selama dua hari dari Korea Selatan menuju Indonesia tepatnya di Iswahjudi Air Force Base. 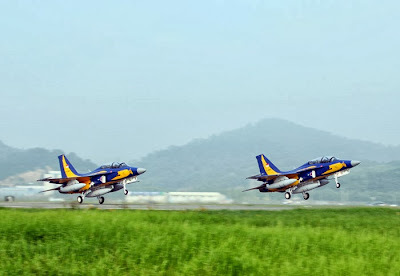 Dengan datangnya dua pesawat T-50i Golden Eagle tersebut, sudah empat elang emas yang bersarang di Skadron Udara 15, dari 16 pesawat T-50i Golden Eagle yang dipesan Pemerintah Indonesia dari Korea. Acara penyambutan ditandai dengan pengalungan bunga oleh Komandan Wing 3 Lanud Iswahjudi Kolonel Pnb Minggit Tribowo, S.IP., kepada penerbang KAI disaksikan para pejabat Lanud Iswahjudi. KAZAN (RIA Novosti) – A Russian shipyard on Tuesday started work on a second pair of frigates for the Vietnamese navy, the shipbuilding company said. The Gepard (Cheetah) class frigates are designed to guard and patrol the state border and economic zone, fight smuggling, poaching and piracy at sea and aid vessels in distress. They are armed with modern missile and artillery systems. 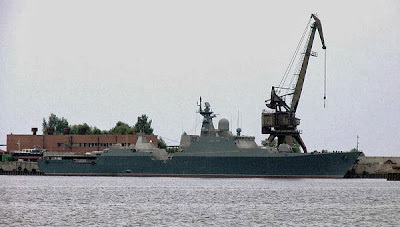 The first contract was signed in 2005, and the first two frigates entered service with Vietnam’s navy in 2011, the Kazan-based Zelenodolsk shipyard said in a statement. The second contract was signed in February 2013. Unlike the first two, the new frigates feature antisubmarine weapons and an advanced propulsion system. 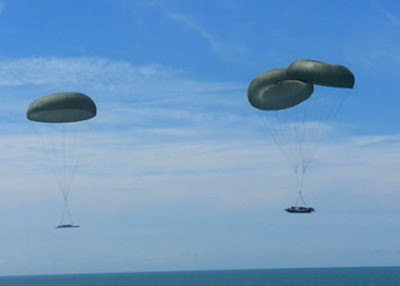 According to the Russian media, Vietnam Ministry of Defense is considering the possibility of buying a jamming system generation by Union Scientific-production (NPO) Kvant Russia's development. 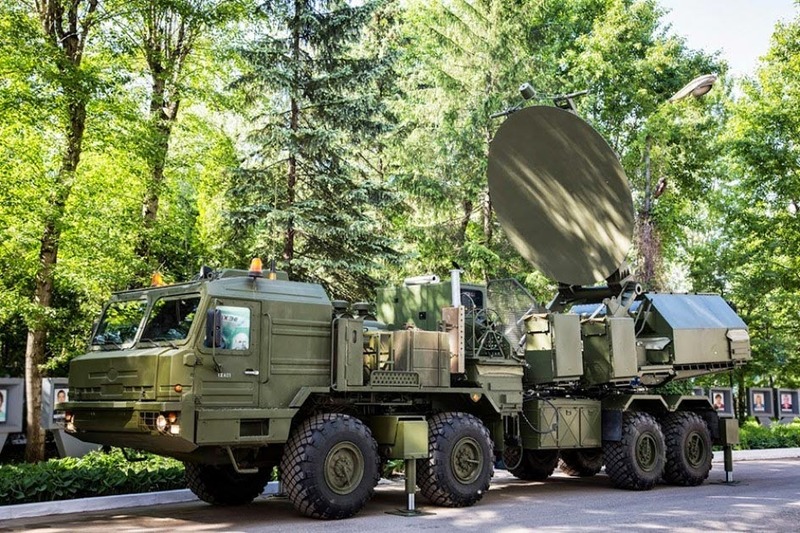 In particular, Vietnam has expressed interest in the system of advanced electronic jamming 1L269 Krasuha-2 new Russian military equipment included in the recent times. According to preliminary information, the station 1L269 Krasuha-2 mode voltage electronic jamming module combines standardized ground to protect air radar target before the formation of the battalion electronic warfare. This is a system of electronic jamming Russian generation newly completed State inspection and starting equipment in 2009. The technical details of the system are still Krasukha Russia kept secret, just know that they are mounted on 4 axle chassis BAZ-6910-022. The system by Gradient Research Institute developed and manufactured in Union Scientific-production Kvant. 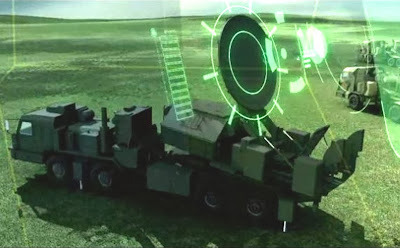 An electronic warfare systems that are more advanced version 1L269 Krasuha-4, has a range of 150-300 km. Among them, 4 Krasuha-4 system has been the first Russian military and Krasuha-2 version will be exported to foreign countries. According to Russian military experts, system interference Krasuha 1L269-2 was developed from military doctrine after the South Ossetia conflict - a war that Russia does not use nearly as system electronic warfare (EW) and an important part, the Air Force has failed on that front in the air when a bomber Tu-22 ground attack aircraft and Su-25, Su-bombers, 24 of them were non-Georgian loss due to fire is not supported by the system jamming, electronic warfare aircraft protection. Experience the war from a mere 5 days but has left considerable damage to the Russian Air Force has forced the military to recognize the important role of jamming systems and modern warfare in modern warfare environment. Krasuha 1L269-2 was developed from that handshake. Krasuha 1L269-2 activities similar general principles of electronic warfare stations, which emit signals are obtained from an opponent, then positioning and conducted radio frequency radiation (radio frequency interference) with high-capacity, application processing and electronic warfare systems, control systems, communications and intelligence of the enemy, as well as changes in the quality of information, quality traffic and to create an environment mess with the transmission of power dominated by the radio station emits electronic, to protect their electronic systems to the impacts of the measures electronic warfare enemy. Complex modern electronic warfare Krasuha 1L269-2 is also only Russian first introduced as a miniature model at LIMA 2013 defense exhibition held in Malaysia at the end of last March. 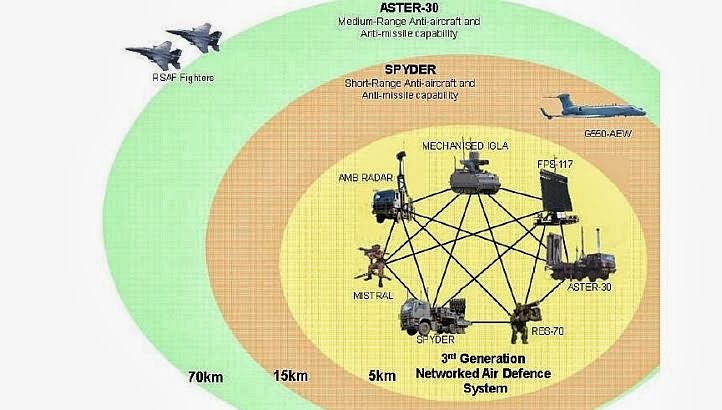 In particular, the manufacturer introduced that combined jamming and electronic warfare capabilities are "blind eye" to the radar systems of modern aviation, including aircraft commander and airborne early warning ( AWACS). In the near future, with the introduction of the system of jamming and electronic warfare advanced Krasuha-2 in our army, it will create a class "E-coat" to protect escape detection as well as contributing significantly enhanced ability to prevent and fight the forces, combat units, especially combat capabilities of air defense radar stations, the air defense missile battalion advanced S -300, complex coastal defense missile Bastion-P ... will be significantly increased. TEMPO.CO, Jakarta - Tentara Nasional Indonesia Angkatan Darat kembali menerima alat utama sistem persenjataan yang baru. 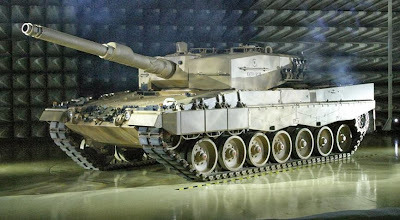 Senjata terbaru itu adalah tank tempur utama (main battle tank) Leopard 2A4 dan tank menengah Marder buatan Jerman. "Sudah datang dua unit Leopard dan dua unit Marder," kata Kepala Staf TNI Angkatan Darat Jenderal Budiman kepada Tempo, Senin, 23 September 2013. Keempat tank itu tiba di Pelabuhan Tanjung Priok, Jakarta Utara, Ahad pagi kemarin. Saat ini keempat tank sedang dalam pengecatan dan persiapan pakai. "Untuk pengecatan masih bisa kami lakukan sendiri," kata Budiman. Budiman mengaku senang dengan hadirnya empat unit tank baru itu. Dia mengatakan tank-tank baru itu bisa memperkuat kemampuan kavaleri Indonesia. Dia menambahkan, dari total 156 tank yang dibeli itu semuanya punya fungsi komplet. Sebagai contoh, bukan tank tempur saja yang diperoleh TNI, melainkan tank khusus ekskavator, buldoser, dan jembatan untuk pasukan Zeni, serta tank penyapu ranjau. Dari informasi yang diperoleh Tempo, kedatangan keempat unit tank ini terbilang lebih awal. Sebab, sesuai dengan rencana, pengiriman awal tank dari Jerman ini dijadwalkan Oktober 2013. Keempat tank ini rencananya bakal dipamerkan dan dilibatkan dalam perayaan hari jadi TNI pada 5 Oktober 2013. Sebelumnya, Kementerian Pertahanan membeli 153 unit tank dari pemerintah Jerman. 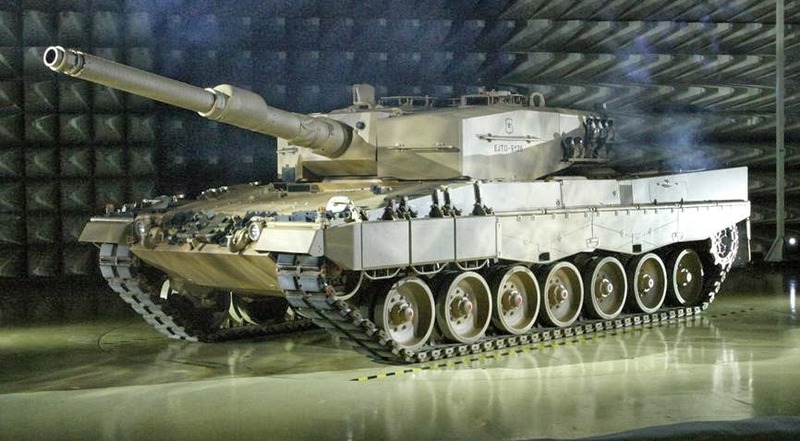 Tank tersebut yakni tank Leopard Ri sebanyak 61 unit, tank Leopard 2A4 sebanyak 42 unit, dan tank Marder sebanyak 50 unit. Pembelian tank ini dikatakan tidak melebihi pagu anggaran sebesar US$ 280 juta. Pembelian tank ini juga dilengkapi dengan kesepakatan transfer teknologi yang diteken pada November 2012 lalu. PT Pindad dan Bengkel Pusat Angkatan Darat akan mendapatkan kerja sama pelatihan untuk perbaikan ringan hingga berat. Kehadiran 153 unit tank ini diharapkan bisa menambah kekuatan TNI AD. Saat ini Indonesia belum juga punya tank kelas berat yang mumpuni. Selama ini, TNI AD mengandalkan tank tempur ringan, seperti Scorpion buatan Inggris, tank AMX-13, dan AMX-10p. Ketiga jenis tank ringan itu terbilang uzur sebab diproduksi pada 1940-1950-an. 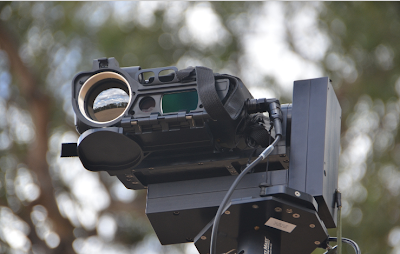 SYDNEY, Australia – The constant monitoring of threats against military bases, forward observation posts and other secure facilities can be time-intensive and dangerous. To solve this problem for the Australian Defence Forces, Rockwell Collins developed and recently delivered the Patrol Persistent Surveillance System (PPSS). PPSS is made up of a meshed network of unattended ground sensors and video cameras that monitor movement, sound and vibration. Alarms from the system are relayed to an operator console and are displayed on a digital map system. In fact, the program has been so successful to date that the combined project team was recently recognized by the Australian Institute of Project Management for Excellence in Project Management. MANILA — With four of the Philippine Navy's multi-purpose assault craft (MPAC) seeing action for the first time and giving a good account of themselves on the ongoing stand-off in Zamboanga City, the PN announced that plans to acquire three more of these excellent vessels are still on going. The Navy currently has six of these high-speed craft in it inventory. 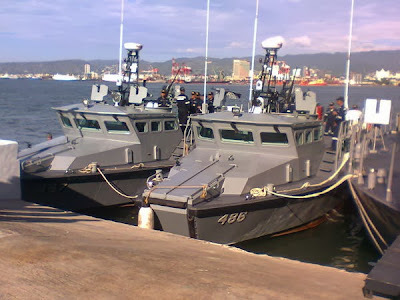 Four of the 28 PN vessels conducting blockade operations off the Zamboanga City coast are MPACs. "(Acquisition of three MPACs) is part of the PN's medium term capability upgrade program. Three MPACs (are scheduled) to be acquire within 2013 to 2017," PN spokesperson Lt. Cmdr. Gregory Fabic said. 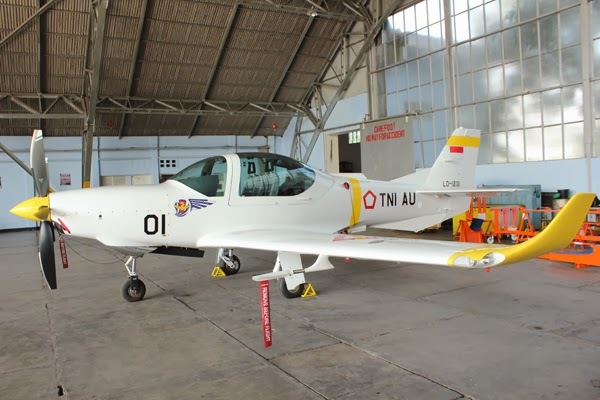 A PN source earlier said that these MPACs are already in Stage 1 of the acquisition process. Fabic said that the MPACs, as proven in the ongoing Zamboanga City operations, are ideal craft for coastal patrol and defense work due to high speed and maneuverability. Three of the MPACs are sourced from Taiwan while the remaining three were ordered from Filipino shipbuilder Propmech Corporation, which is based in Subic Bay, Zambales. These ships are 16.5 meters long, 4.76 meters wide and has a draft of one meter and a top speed of 45 knots. Each one is worth around P90 million. It has a range 300 nautical miles. The hull is made of high-quality aluminum and is crewed by one officer and four enlisted personnel. It is capable of carrying 16 fully-equipped troopers or two tons of cargo. The MPAC is capable of operating in territorial waters up to "Sea State 3" (slight waves) without any system degradation. 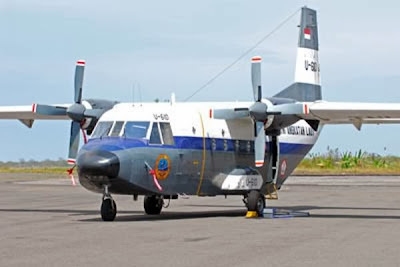 YOGYAKARTA, KOMPAS.com — Empat pesawat latih Grob G120TP-A buatan pabrik Grob Aircraft di Tussenhausen-Mattsies, Jerman, hari Jumat (20/9/2013) ini, diserahterimakan di Lanud Adisutjipto, Yogyakarta. 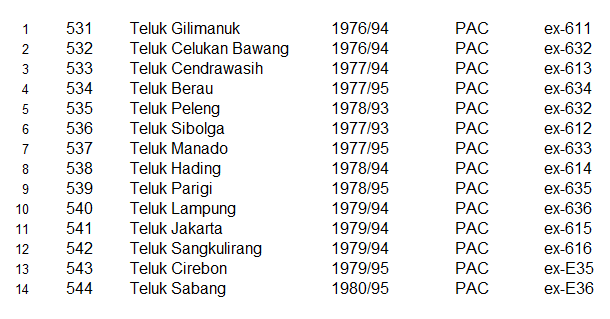 Empat pesawat yang telah selesai dirakit tersebut adalah bagian dari 18 pesawat latih yang dipesan Tentara Nasional Indonesia Angkatan Udara (TNI AU) hingga pertengahan 2014. Ke 18 pesawat, termasuk empat yang diserahterimakan pada hari ini, semuanya menggunakan mesin Rolls Royce tipe 250-B17F. Kecepatan maksimum 429 kilometer per jam atau 237 knot. "Empat pesawat latih itu sudah pernah diuji coba terbang pada 28-29 Agustus 2013 yang lalu," ujar Mayor Sus Hamdi Londong Allo, Kepala Penerangan dan Perpustakaan Landasan Udara Adisutjipto, Yogyakarta, Jumat (20/9/2013). Sus Hamdi memaparkan, pesawat latih Grob G120TP-A bermesin turbo prop menggunakan lima bilah baling-baling. Model sayapnya model rendah (low wing) dan cantilever. "Tangki bahan bakar diletakkan di dalam kedua sayap. Kapasitas bahan bakar sebanyak 360 liter dengan lama penerbangan selama 5 jam dan cadangan 45 menit," imbuhnya. Keunggulan lainya adalah pesawat latih ini dilengkapi dengan kanopi gelembung model geser. Hal itu memungkinkan pilot melayangkan pandangan hampir 360 derajat dari dalam kokpit. Pesawat baru yang dimiliki TNI AU ini merupakan pengganti pesawat AS 202 Bravo. Pesawat jenis Grob G120TP-A telah memenuhi operational requirement yang mengalahkan pesaingnya, yaitu Finnmeccaniicaa (Alenia Aermacchi) SF-260TP dan Pacific Aerospace CT-4. "Pesawat ini lebih lincah dan memiliki kecepatan lebih," ujar Sus Hamdi. KEBERADAAN Kapal Perang Republik Indonesia (KRI) jenis Landing Ship Tank (LST) dan kapal Landing Platform Dock (LPD) amat penting dalam penyebaran pasukan ke suatu wilayah. Dalam operasi amfibi, peranan LST sangat krusial dalam penyerbuan pasukan ke wilayah musuh. 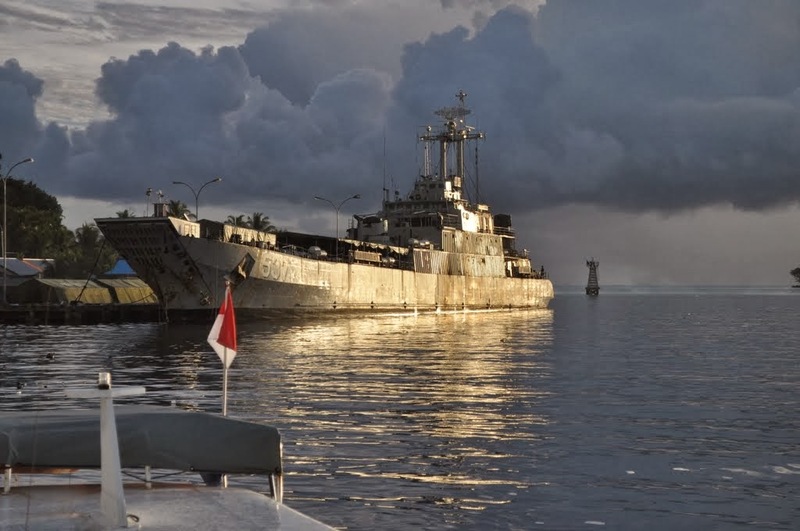 Di lingkungan TNI Angkatan Laut, keberadaan LST dan LPD dinaungi oleh Satuan Kapal Amfibi (Satfib) yang terdiri dari Satfib Koarmabar dan Satfin Koarmatim. Bicara lebih spesifik tentang LST di Satfib TNI AL, tentu tidak bisa dilepaskan dari keberadan Frosch Class (LST kelas Frosch) buatan Jerman Timur. 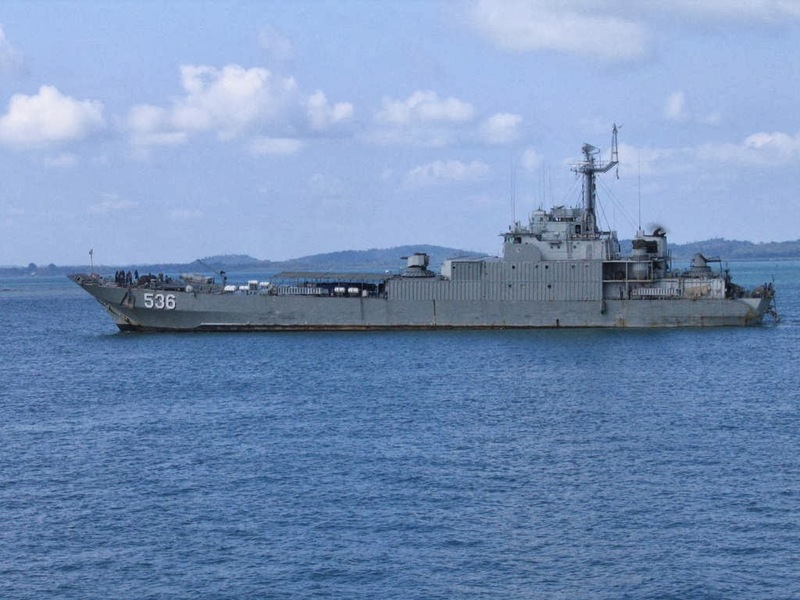 Alasannya jelas, jumlah Frosch class mencapai 14 unit, artinya kapal ini adalah tipe LST yang paling banyak dioperasikan TNI AL. Bila dirunut dari spesifikasinya, Frosch class dengan bobot penuh (full) 1.900 ton adalah LST tipe medium (menengah). LST ini punya dimensi 90,70 x 11,12 x 3,4 meter. Ditenagai dua mesin diesel dengan dua shafts yang menghasilkan tenaga 12.000 bhp. Jangkauan berlayarnya bisa mencapai 2.450 km. Meski ukurannya medium, Frosch class dapat membawa 11 tank amfibi atau muatan kargo seberat 400 – 600 ton. Untuk membawa pasukan pendarat, kapal dengan jumlah awak 42 orang ini diperkirakan bisa dimuati maksimum 1 kompi marinir. 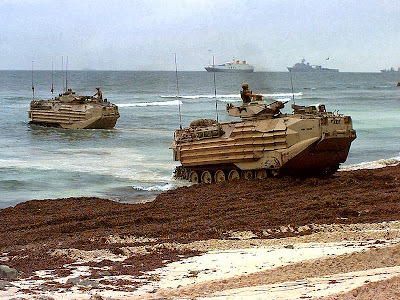 LST Frosch class dibangun oleh galangan VEB Peenewerft, Wolgast, Jerman Timur pada periode tahun 1976 hingga 1980. Satu nasib dengan korvet Parchim dan penyapu ranjau kelas Kondor yang juga diborong TNI AL, LST Frosch class pasca reunifikasi Jerman juga dipensiunkan dari arsenal armada AL Jerman. Keseluruhan jenis kapal ini memang diborong ke Indonesia lewat lobi BJ Habibie yang menjabat selaku Menteri Negara Riset dan Teknologi di awal tahun 90-an. Lalu bagaimana dengan persenjataan di Frosch class? Senjata yang melekat pada kapal pendarat ini sejatinya cukup sangar, aslinya sejak tahun 1986, Volksmarine (AL Jerman Timur) melengkapi beberapa Frosch dengan meriam laras ganda AK-725 kaliber 57mm. Meriam ini adalah senjata utama pada korvet Parchim, sayangnya saat Frosch dijual ke Indonesia, meriam ini nampak sudah dilepas, sebagai gantinya adalah meriam Bofors kaliber 40mm. Sebagai elemen perlindungan (decoy) dari serangan rudal udara, Frosch class juga dibekali dengan dua dispenser chaff PK-16, masing-masing tabung terdiri dari 16 tabung peluncur. Kemampuan elektronik Frosch class ditunjang satu radar navigasi TSR-333, satu radar MR-302 Rubka untuk identifikasi obyek di udara dan permukaan. Brisbane, Australia, September - (NYSE: CAE; TSX: CAE) - Today at the SimTect/SimHealth show, Australia's annual conference and exhibition focused on simulation, CAE announced that the Royal Australian Air Force (RAAF) KC-30A full-flight and mission simulator (FFMS) has been accredited by the Australian Defence Force Airworthiness Authority to Level D. The accreditation was conducted by an independent authority under the Australian Civil Aviation Safety Authority (CASA) Manual of Standards (MoS) Part 60 criteria. This is the world's first A330 Multi-Role Tanker Transport (MRTT) simulator formally qualified to Level D, the highest qualification for flight simulators. 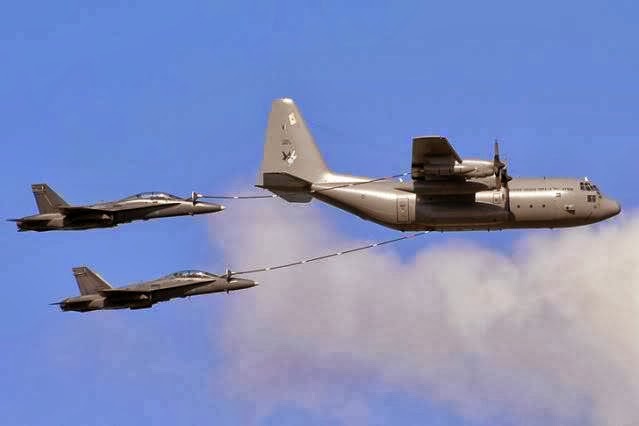 "Aerial refueling is a complex, challenging and sometimes dangerous operation so we need the highest fidelity training systems to prepare our aircrews for mission success," said Ewan Ward, Project Director, Project Air 5402 - Air to Air Refueling, Defence Materiel Organisation. "Our new KC-30A full mission simulator combined with the full suite of KC-30A training devices will play a key role in cost-effectively training our tanker aircrews to accomplish a range of refueling missions." The RAAF's KC-30A training system, designed and developed by CAE under subcontract from Airbus Military and now in operation at RAAF Base Amberley, comprises the KC-30A FFMS, a CAE Simfinity KC-30A integrated procedures trainer (IPT) for pilot familiarization and procedural training, and a KC-30A air refueling officer part-task trainer (ARO PTT) for training both boom and hose and drogue refueling operations. Both the KC-30A FFMS and IPT can be networked with the KC-30A ARO PTT to create a complete crew training environment for pilots and air refueling officers. 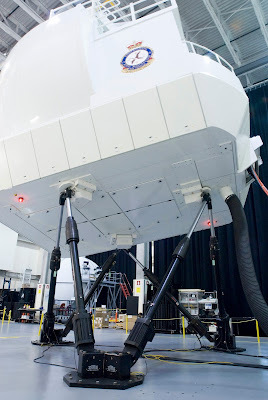 Additionally, the full suite of training devices is supported by an off-board instructor station and a debriefing station that can provide complete mission training playback functionality. "The Royal Australian Air Force fully understands and appreciates the value that high-fidelity, simulation-based training delivers as part of the overall training and preparedness of its aircrews," said Peter Redman, Managing Director of CAE Australia. "CAE is pleased to have delivered one of the world's most advanced suites of tanker training systems, and look forward to supporting the RAAF on the KC-30A tanker program for many years." CAE now has responsibility, under the Management and Support of ADF Aerospace Simulators (MSAAS) contract, to manage, maintain and support the KC-30A training systems and training facility at RAAF Base Amberley. CAE instructors are also conducting aircrew training courses on behalf of the Commonwealth of Australia, including providing initial type conversion and refresher training. Minister for Defence Dr Ng Eng Hen officiated at a ceremony to mark the achievement of Full Operational Capability (FOC) status by the Republic of Singapore Air Force's (RSAF) F-15SG multi-role fighter aircraft at Paya Lebar Air Base this afternoon. Speaking at the ceremony, Dr Ng highlighted the significance of this milestone to the overall enhancement of Singapore's air defence capabilities and also emphasised the importance of having a strong RSAF. He said, "The RSAF's F-15SGs have been rigorously tested and proven superior in air defence and strike capabilities, and integrated with other air platforms within the RSAF, which together are able to respond to a spectrum of threats to defend and dominate our skies. A strong RSAF provides confidence that Singapore is well capable of defending its sovereignty and protecting our precious homeland." The F-15SG is operated by 149 Squadron locally and the RSAF's Peace Carvin V (PC V) Detachment at Mountain Home Air Force Base in the United States. It is one of the most advanced variants of the F-15 strike aircraft which has a distinguished combat record of over 100 kills to 0 losses. The F-15SG is equipped with state-of-the-art avionics, a sophisticated integrated sensor suite and network capabilities, which help enhance the RSAF's battlefield awareness. Along with its superior firepower and combat endurance, the aircraft provides the Singapore Armed Forces (SAF) with enhanced air defence and air superiority capabilities. After taking delivery of the aircraft in May 2009, the F-15SG pilots, weapon systems officers and maintenance crew have undergone intensive training to operate and maintain the aircraft, as well as to integrate the aircraft to support the SAF's operations. 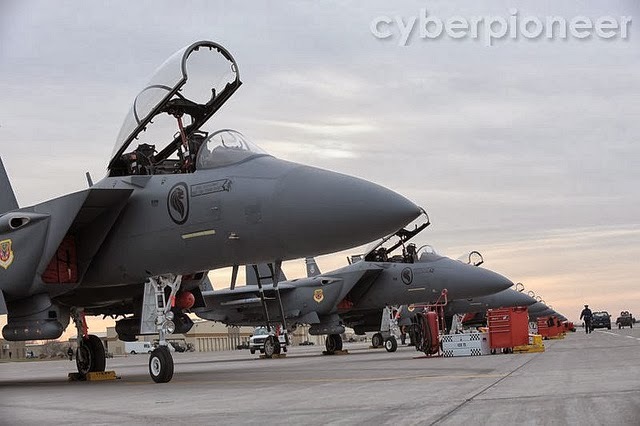 During this period, the F-15SGs have also participated in major exercises such as Exercise Forging Sabre, Exercise Cope Tiger, Exercise Pitch Black, Exercise Bersama Shield and Exercise Red Flag. 149 squadron, which began operating the F-15SG in 2010, also won the RSAF's Best Fighter Squadron award in 2011 and 2013. Also present at the ceremony were Minister of State for Defence Dr Mohamad Maliki Bin Osman, Chief of Defence Force Lieutenant-General Ng Chee Meng, Chief of Air Force Major-General Hoo Cher Mou as well as other senior officers from the SAF. Keberadaan PT Dirgantara Indonesia patut menjadi kebanggaan negeri ini, khususnya, Jawa Barat. Pasalnya, lembaga BUMN yang dulunya bernama Industri Pesawat Terbang Nusantara tersebut memperoleh kepercayaan berbagai pihak, tidak hanya domestik, tetapi juga mancanegara untuk menggarap pembuatan dan pengembangan pesawat. 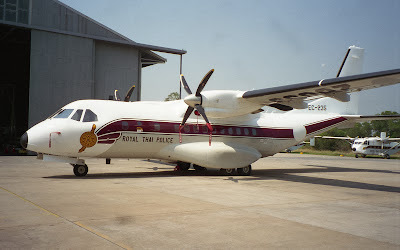 Terbukti dengan adanya penandatanganan kerjasama antara PT DI dan industri dirgantara asal Thailand, Thai Aviation Industry. Kesepakatan kerjasama itu resmi terjalin setelah adanya penandatanganan antara Direktur Utama PT DI, Budi Santoso, dan CEO TAI, Marsekal Weeran Hansvata, di Lantai I Gedung Pusat Manajemen PT DI, Selasa (17/9). Sonny Saleh Ibrahim, Direktur Bidang Kualitas sekaligus Manager Komunikasi PT DI, menyebut, kerjasama antara pihaknya dan TAI tersebut merupakan tindak lanjut penandatanganan nota kesepahaman atau MoU. “Penandatanganan MoU itu berlangsung 18 Agustus 2010,” ujar Sonny. Sonny mengemukakan, sejauh ini, Kementerian Pertanian Kerajaan Thailand memiliki dan mengoperasikan 7 pesawat produk PT DI, yang terdiri atas 5 unit NC 212 dan 2 unit CN 235. “Penggunaan pesawat-pesawat produk PT DI oleh pemerintah Thailand itu untuk menurunkan hujan buatan,” terangnya. Sedangkan kerjasama terkini, lanjut Sonny, PT DI bersepakat dengan TAI untuk melakukan penjualan, custominasi, termasuk perawatan dua pesawat. “Jenisnya, CN 235 dan N 219,” tandasnya. 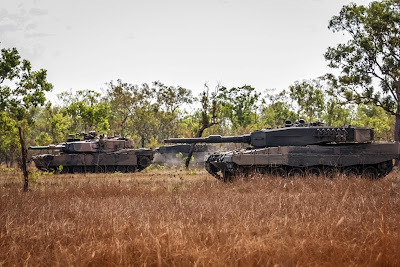 The Singapore Armed Forces (SAF) and Australian Defence Force (ADF) conducted a bilateral armour exercise, codenamed Matilda, from 16 to 17 September 2013 at the Mount Bundey Training Area in Darwin, Australia. 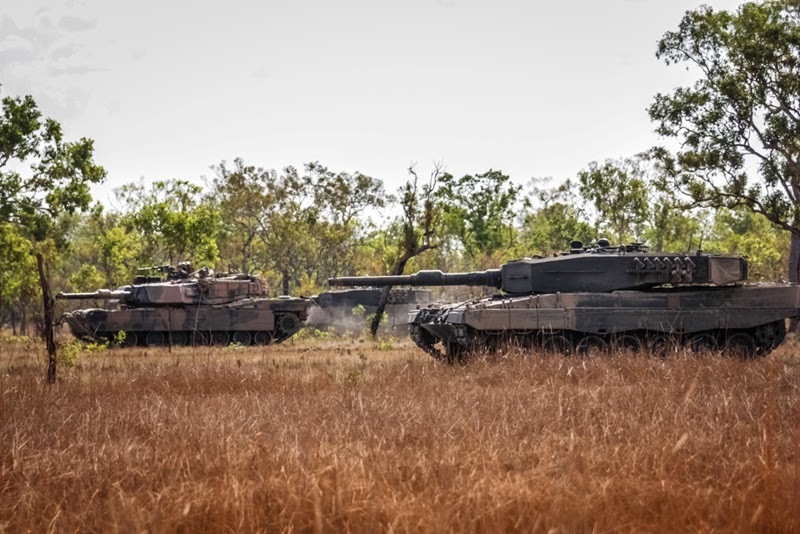 About 100 personnel from the 48th battalion, Singapore Armoured Regiment (48 SAR) and their Leopard 2SG Main Battle Tanks (MBTs) are involved in the training with their ADF counterparts from the 1st Armoured Regiment. During the exercise, both forces had a professional exchange on MBT doctrine and operations, and conducted a series of tactical missions together. The exercise culminated today in manoeuvre training between the MBTs of both armies. Prior to the exercise, the troops conducted MBT training from 2 to 15 September 2013 in tank gunnery skills and tactical manoeuvre. On the significance of the exercise, Lieutenant Colonel Koh Kian Wee, Commanding Officer of 48 SAR, said, "Exercise Matilda is an excellent opportunity for our Army and the ADF to come together to share professional insights and to build rapport. It allows our soldiers to hone their gunnery skills and manoeuvre under challenging and realistic conditions." Exercise Matilda is testament to the close and long-standing defence ties between Singapore and Australia. The SAF and the ADF interact extensively through bilateral and multilateral training exercises, mutual visits, professional exchanges and cross attendances of courses. The two armed forces have also worked together in close partnership in the multinational reconstruction efforts in Afghanistan. 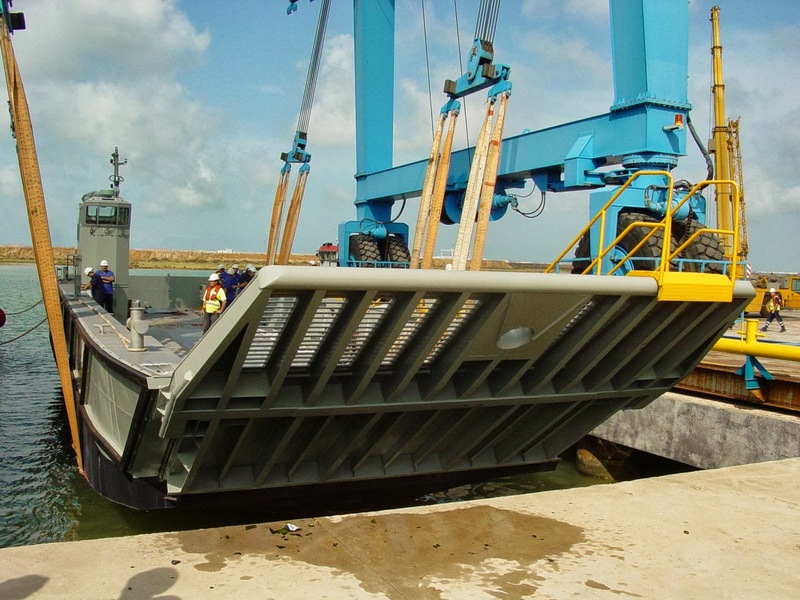 Navantia has set afloat, today at 12:00, the first of the series of twelve fast landing crafts that is building for the Royal Australian Navy. The design of these ships is based on the ones built by Navantia for the Spanish Navy and commissioned from 2006 to 2008. The contract, signed in December 2011, includes the total construction in Navantia in the Bay of Cádiz, and means a workforce of 350,000 hours. The landing crafts are destined to operate with the ALHD “Canberra” and ALHD “Adelaide”, strategic projection ships, similar to LHD ”Juan Carlos I”, also built by Navantia. Commissioning of the four first units is scheduled for April 2014. - Lenght overall: 23.30 m.
- Floatation lenght: 21.27 m.
- Loading capacity flexibility: Abrams vehicle, several Army vehicles, fusiliers’ company or 20 feet container truck. Australia is a strategic country for Navantia, regarding the number of naval programs, where Navantia presents as a solid and safe option. Recently, Navantia has created Navantia Australia Pty, as a proof of our commitment in the country. 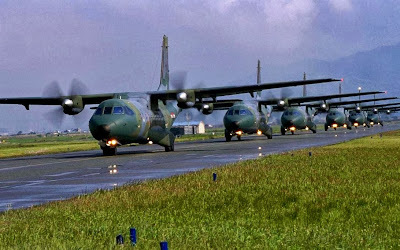 MANILA, Philippines - The Department of National Defense (DND) is set to acquire three medium transport planes for P5.3 billion to enhance the logistics capability of the military. The STAR learned that the bidding for the aircraft acquisition project would be held next month while the bid notice would be issued this week. 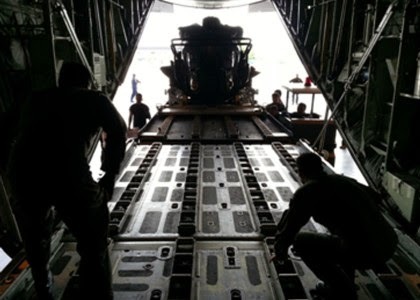 The planes that could airlift troops and supplies are expected to provide support for territorial defense and internal security operations. 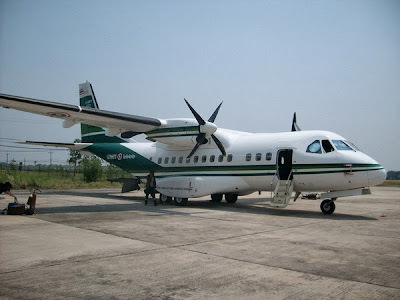 The aircraft will also be used for disaster response and development efforts. The package will cover integrated logistics support for the aircraft. “We are fast-tracking the projects that will upgrade the capabilities of the armed forces,” Defense Undersecretary Fernando Manalo said. To be qualified, a prospective bidder should have completed a similar aircraft project. Interested parties may buy a complete set of bidding documents from the Bids and Awards Committee secretariat for P75,000. The pre-bid conference, which will allow prospective bidders to clarify the requirements set by the government, has been slated for Sept. 23. The deadline for the submission of bids will be on Oct. 7. The opening of bids will be held on the same day. Defense officials and a military technical working group will review the bids from Oct. 7 to 14. The review will determine if the offers submitted complied with financial and technical requirements set by the government. The company that offers the lowest bid will undergo a post-qualification phase, wherein security officials validate the documents submitted by the bidder. The post-qualification phase will be held from Oct. 15 to Nov. 14. If the company that offered the lowest bid satisfies all the post-qualification requirements, it may be declared the winning bidder by November. 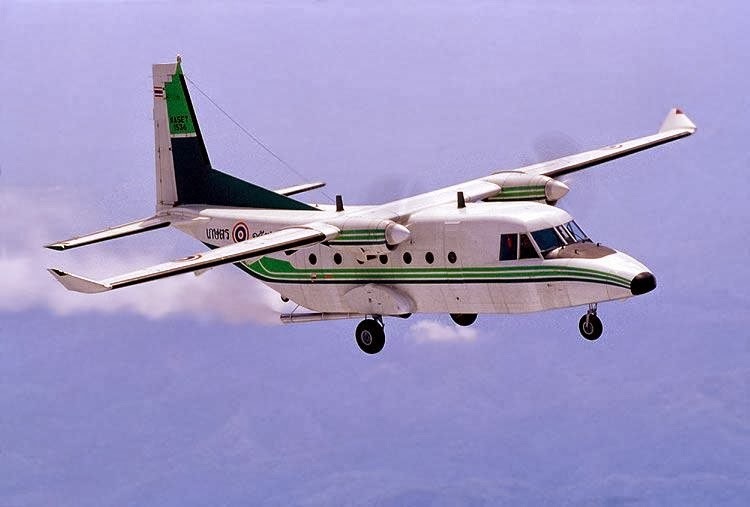 The government is planning to buy several air assets in the next few years to improve the capability of the Air Force. Aside from the three medium transport aircraft, the air assets to be acquired include 21 UH-1 combat utility helicopters for P1.26 billion, 12 lead-in fighter trainer jets for P18.9 billion, and long-range patrol aircraft for P5.96 billion. The government is also eyeing the acquisition of air surveillance radars worth P2.68 billion to enhance the country’s territorial defense capabilities. Air Force data showed that a total of 95 air assets in the inventory are beyond repair, outnumbering those that are operational. Out of the 265 air assets in the inventory, 95 can no longer be used, 71 are operational while the rest requires repairs. 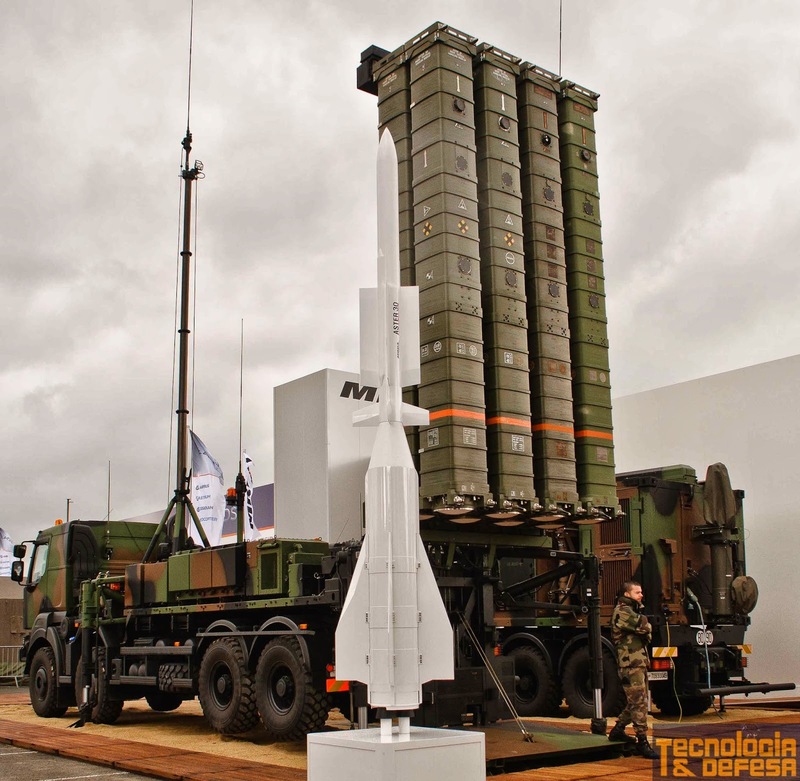 The Singapore Armed Forces will buy a new Aster-30 surface-to-air missile system, to boost Singapore's air defence shield. Announcing the acquisition on Monday, Defence Minister Ng Eng Hen said advanced militaries in France and Italy use the new system, which is "many times more potent" than the current I-Hawk ground-based air defence system. 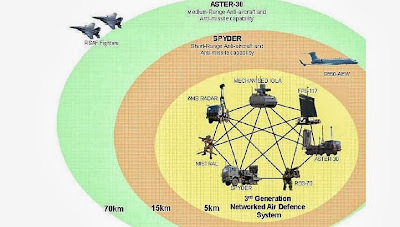 "The Aster will allow us to engage multiple threats simultaneously and from a longer distance," Dr Ng told Parliament, adding that the new system will complement a mobile and shorter-range ground-based air defence system known as Spyder. He was responding to Nee Soon GRC MP Lim Wee Kiak on the Republic of Singapore Air Force's (RSAF) operational readiness with the planned relocation of Paya Lebar Airbase to Changi East at around 2030. Dr Ng did not say how much the move, which was announced last month, would cost. The RSAF is also looking to upgrade its fighter fleet, such as modernising the avionics system and extending the lifespan of the F-16s. The advanced capabilities being built up gave Mindef and SAF the confidence to move Paya Lebar Airbase, following a 2011 study of capabilities and security threats for the long term, Dr Ng said. "We satisfied ourselves that our security would not be compromised and that relocation of PLAB could take place after existing airbases at Changi East and Tengah have been expanded to accommodate relocated assets and facilities," he said. He added that the move will be costly, but will yield "billion dollars' worth of positive returns to the people in Singapore" in terms of land released for development and the removal of height restrictions in the area. Supreme Commander of the Royal Thai Armed Forces declares the Gripen Integrated Air Defense System commissioned as a fully operational part of the air force at its home base, Wing 7 in Surat Thani. 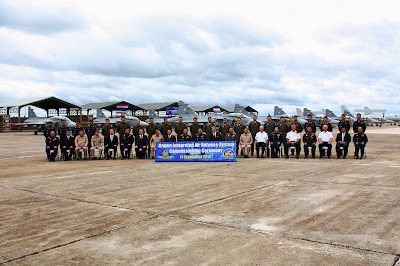 The Royal Thai Air Force held a ceremony on 11 September at Wing 7, Surat Thani, to officially declare the Gripen Integrated Air Defense System commissioned as a fully operational part of the air force. General Thanasak Patimaprakorn, Supreme Commander of the Royal Thai Armed Forces, officiated over the ceremony along with RTAF Commander ACM Prajin Juntong and high ranking representatives from the Royal Thai Army and the Royal Thai Navy. The ceremony was attended by Thai and Swedish guests, diplomats, press and foreign military attachés stationed in Thailand. The presence of all three military branches at the ceremony symbolizes what the new system stands for: integrated defense operations. With the 12 Gripen fighters on order from Sweden delivered and operational as well as two SAAB 340 AEW aircraft, radar stations, command and control systems and much more, Wing 7 stands ready to defend and protect the Thai nation with a state of the art integrated air defense system.